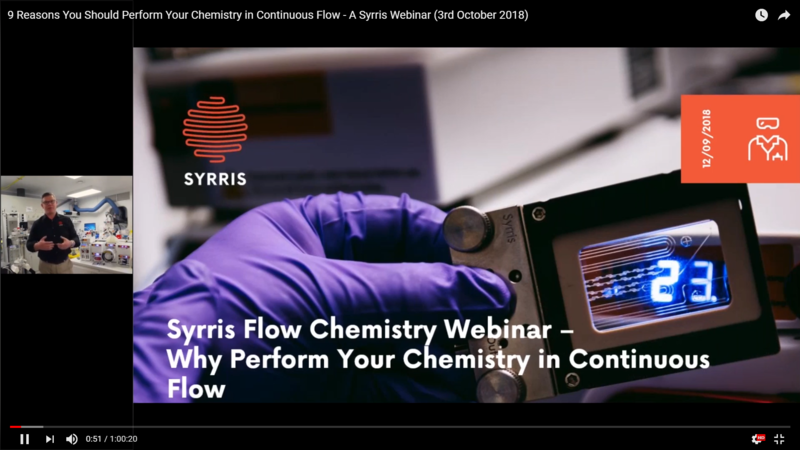 This webinar was a follow-up to the very popular “Introduction to Flow Chemistry and its First Principles” webinar, and involved Andrew Mansfield, Head of Flow Chemistry at Syrris, explaining the 9 main reasons chemists are switching to continuous flow techniques for their chemistry. After the 9 main reasons, Andrew goes on to give specific published examples of how the 9 main benefits have directly improved existing chemistry or opened up novel chemistry spaces. The webinar was aired live on 3rd October 2018. Simply fill in the form below to view the recording, and subscribe to updates to be kept informed of future webinars. Students and experienced chemists looking to further their understanding of flow chemistry. Simply register your details to watch the webinar recording. Tick the “subscribe” box if you’d like to be kept informed of upcoming webinars and other information from Syrris. At the end of our webinars, we answer questions our attendees have asked throughout the session. Here’s the list of questions we received during this webinar session. There were too many to answer in the live webinar but we made sure to get back to everyone who asked a question immediately. It is possible to use solids in a flow chemistry experiment if they are kept isolated in a solid bed column and the reagent would simply run through the column – this is used with solid scavengers or catalysts for example. There is a finite of material available in the column which will deplete over time as the reaction occurs on the surface on the solid. It has been shown that the performance of using such solids has a continuous reaction profile until the reagent is near completion and then the performance drops. In order to regenerate the solid phase between experiments, you would only have to disconnect the solid bed column from the fluidic network, open it and remove the used remaining solid and replace it with a fresh amount. It is possible to run multiple reactions in parallel for scaling up for example – this approach is called “scaling out” but would require multiple duplicate equipment. You can use 3 microreactors at the same time in parallel but you would also require a pump for each reactor as well as a temperature control unit and possibly a pressure controller for each setup as well. If your question was about telescoped reactions which is the art of doing multi-step synthesis in a row without work-up in between it is also possible to have 3 microreactors one after the other for each reaction step. Flow chemistry can be a powerful tool for peptide synthesis depending on your reaction conditions. There are a number of approaches when working with homogeneous solution with dissolved substrates that generally involve multiple steps or function protection, coupling and deprotection using flow liquid-liquid extraction work-up to remove by-products. However, the most used method for multiple amide coupling in flow is to use solid phase reagents packed in a solid bed column. You can use supported coupling reagents such as HOBt, HBTU, TBTU etc… with immobilized acid and simply flow a range of amines through the column to form the amide. This is the approach that peptide sequencer are using. You are right working under pressure will increase the boiling point of the solvent and reagent in the reactor – however when exiting the microreactor the organic stream will continue to flow through the tubing and as it won’t be in contact with any heating sources anymore and due to the high surface to volume ratio of the tubing the organic stream will rapidly cool down to room temperature. Of course, to avoid any issue it is recommended to allow the right length of tubing (depending on the flow rate) to make sure the organic stream has cooled down enough before collecting the product. For this question about fluidic connectors I would redirect you to our sister company Dolomite Microfluidics that supplies a range of microfluidic connectors, chips, fittings, tubing etc… You can browse through the website which item would work with your existing system – If you need more help just get in touch. The Back Pressure Regulator or BPR is used to generate back pressure in order to pressurize the system up to 20 bar. This is useful for superheating your solvent (reaching a higher boiling temperature) to increase the reaction speed and it also helps to control gas evolution if needed. It isn’t necessary to use a BPR if your chemistry doesn’t need higher pressure or gas control. 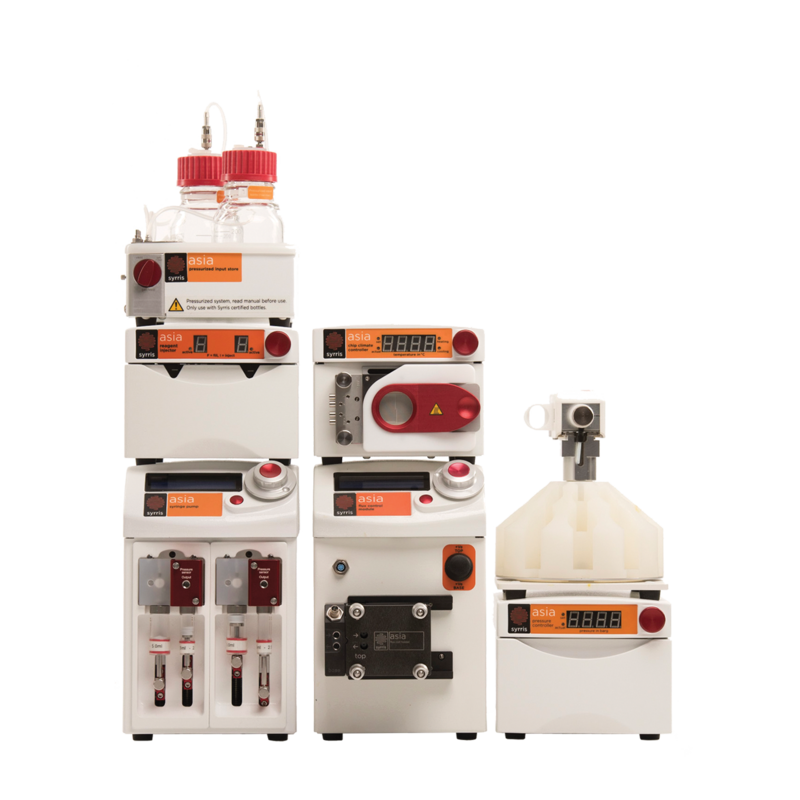 Syrris as a company doesn’t supply in-line analytical equipment however it is possible to use technics such as UV, IR, Raman, and even small benchtop NMR are available. It is important to know that such devices can be integrated but they will also use their own proprietary software. The Asia Software doesn’t work with LabView at the moment but we’re in the process of opening our Software in the future to enable that. Yes, you are right – if you work at low temperatures and without any gas generation, a BPR isn’t needed. Please note that if you work at room temperature with a exothermic reaction it is recommended to have a BPR installed, however. It is also good to know that syringe pumps work better when they have some back pressure to pump against. Most fraction collectors have the ability to collect into HPLC vials and even microtitre plate. Continuous stirred-tank reactors (CSTR) are useful when you have a slurry or a suspension that you can’t really translate in an actual flow chemistry process – it’s also useful in crystallization applications. In a flow chemistry reactor, the flow is laminar and mixing occurs by diffusion. This is a very fast and efficient mixing process when you work with homogeneous and miscible reagents. 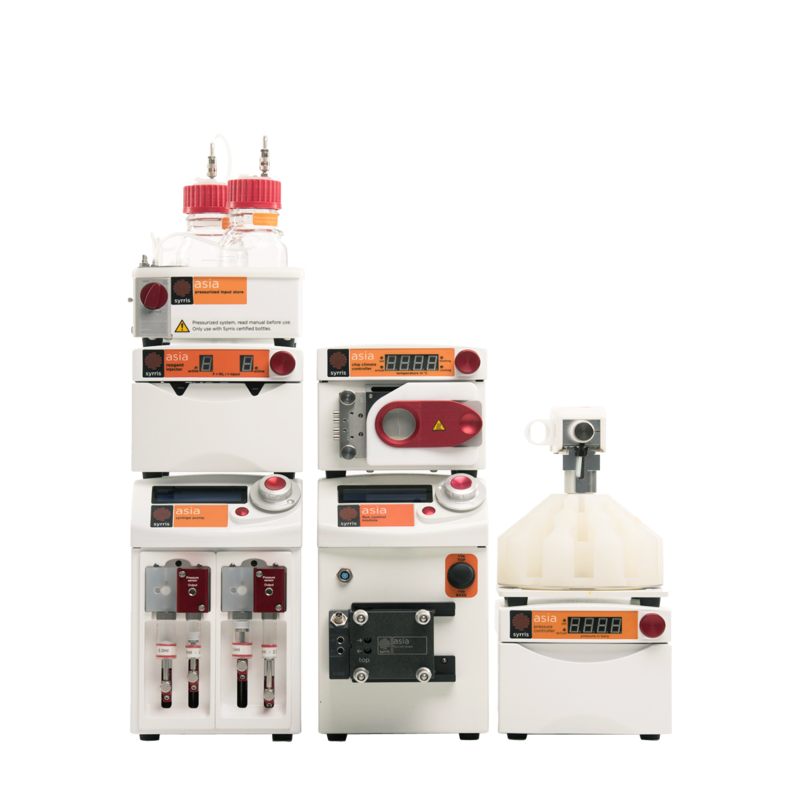 If you work with hardly miscible reagents (oil and water for example) or heterogeneous reagents (gas and liquid) it is recommended to use a static mixer instead. We have designed a microchip called the micromixer which has a channel design that would split and recombine the flow effectively mixing reagents. To perform flow liquid-liquid extraction we have design a module called the FLLEX (for Flow Liquid-Liquid Extraction) which uses a membrane technology as you mentioned in order to separate the organic phase and the aqueous phase. The module would mix the organic stream coming from the microreactor with an aqueous stream (it can be water or even diluted HCl for acidic work up for example) to create slugs of water/organic/water/organic/water etc… and the extraction would occur at the interface. Then the stream would be passed through a membrane and by applying the right cross-membrane pressure you will be able to push the organic phase through the membrane and repel the aqueous stream effectively separating them. It is really easy to run flow chemistry reactions under inert atmosphere as the system is ultimately sealed. First, you need to dry the whole fluidic pathway by flushing a dry solvent through it. The other challenge is to keep your feeding vessel under inert atmosphere as well. 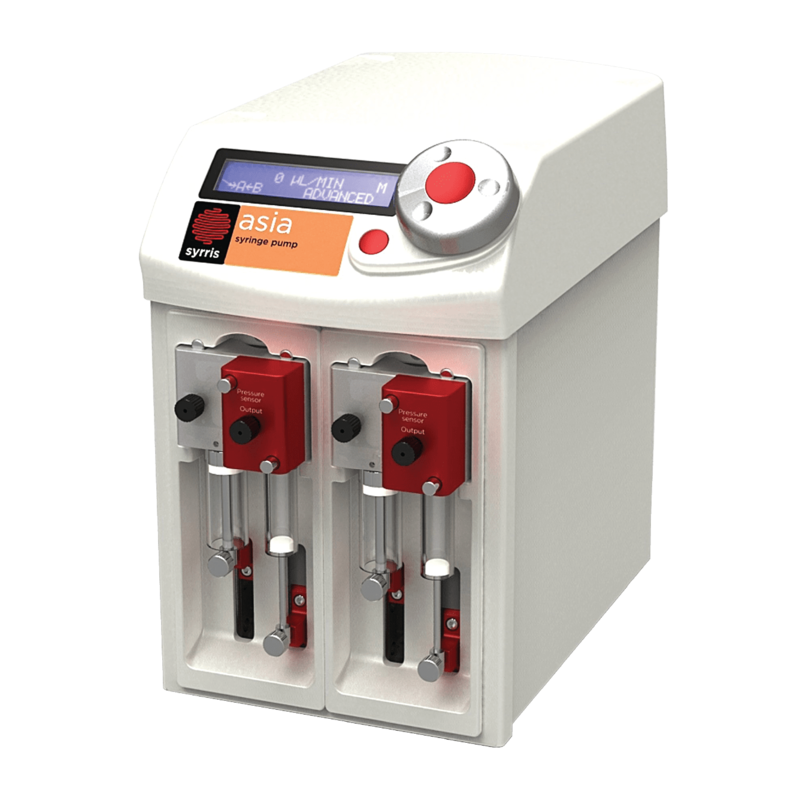 Syrris has developed a pressurized input store that will keep the starting reagent in bottles under 1 bar pressure of inert gas (it can be N2 or Ar). Once the flow system has been flushed with a dry solvent and the feeding vessels are also under inert atmosphere the whole system will stay dry and inert. We have examples of users performing air and moisture sensitive chemistry with n-BuLi, Grignard reagents or DIBAL-H.
You are right – PTFE isn’t recommended for scaling up a flow chemistry experiment also because it is limited in terms of Temperature (125°C) and Pressure (10 bar). For scaling-up we would rather use materials such as Glass, Stainless Steel or Hastelloy which have a better thermo-conductivity. It is important to note that flow chemistry and batch chemistry are best used as complementary tools as both technics have their strengths and weaknesses. One of the limitations of flow chemistry is the inability to work with solids. It can be difficult to pump suspensions or slurries as they will settle in the syringes of the syringes pump and can block the channels and tubing. Fortunately, it is possible to use Solid Bed Columns for use of solids catalysts or scavenger for example. It is also challenging to pump viscous material (viscosity above 1,000 cP) as it will generate a lot of back pressure in the system. You also need to have a good understanding of your chemistry to avoid any insoluble by-product formation or salt formation/precipitation that could potentially block the system. These limitations can be worked around to avoid any issues and Syrris can help tackle some of these challenges with its wealth of knowledge. When using heterogeneous/supported solid catalysts, the recovery process is as simple as drying the solid bed column and recovering the catalyst. If you’re using a homogeneous catalyst, then the process is the same as for any other organic chemistry reaction that uses catalysts.